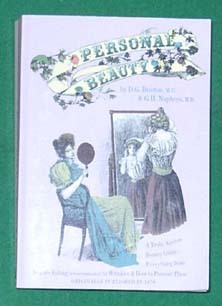 The full title is Personal Beauty: The Laws of Health in Relation to the Human Form. The original copyright date (and the cover is definitely a modern creation) is 1870. Despite that date of original publication, many of the receipts (recipes) are drawn from books that were printed 20 or more years previous. Further, the authors did not come up with their advice overnight so, if used with discretion and the realization that the collection of information was published five years after the end of the civil war, it can be a fairly reliable source of information about the practices used during that time period. This book is written by two doctors and, as might be expected from such authors, is replete with cautions about various beautifying practices of the time period or habits which deform the appearance. Of course, if we read between the lines of such advice, it tells the modern reader that the practices must have been sufficiently common for the doctors to feel it necessary to comment about them. An example is their discussion of rouge -- which they mention is relatively common and not associated only with ladies of ill-repute -- where they describe the safe formulations while cautioning about unsafe ingredients in others. The receipts are relatively few in number (the authors relying mainly on healthful practices or methods not requiring creation of a product) and mostly for cleansing products and other similar uses. As with other period books, we caution the modern reader against formulating any of them unless sure of their safety, both in the ingredients and method of application. The same caution applies against using any of the procedures recommended in the book.